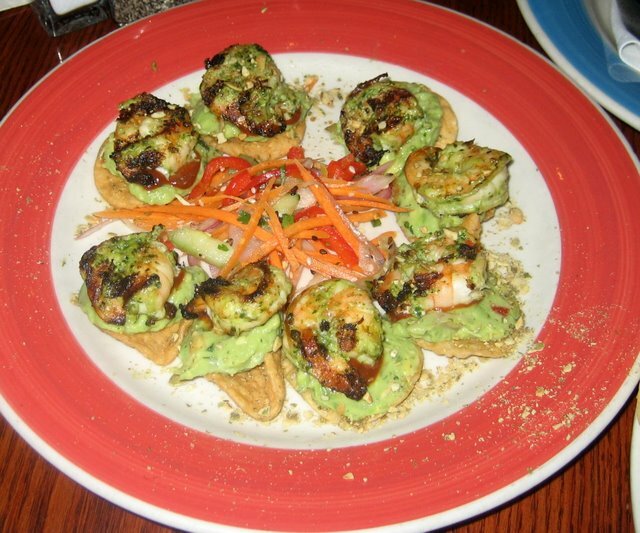 This dish consists of herb and pumpkin seed tostada chips topped with fresh guacamole, cilantro pesto marinated grilled shrimp and a hint of chipotle as well. The shrimp is delicious and the smoky flavor really comes through. The crunchy chip underneath is a little bonus that goes well together! 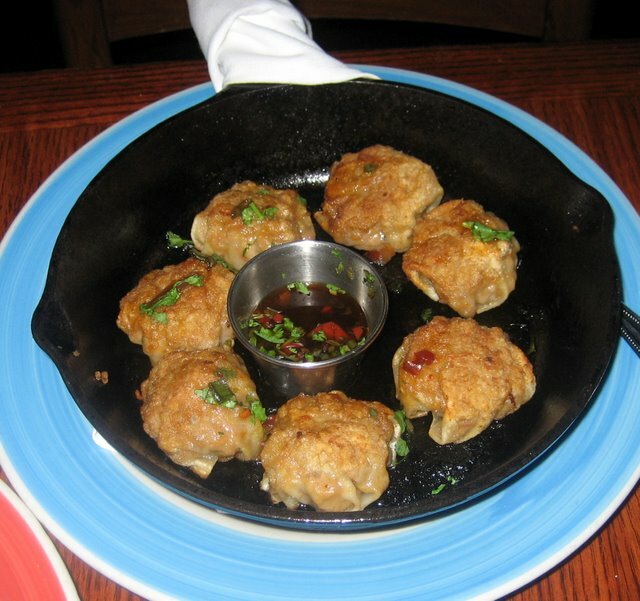 These wontons are filled with spicy shrimp and pork, steamed and then seared. This is served with a sweet and tangy ginger soy dipping sauce…an excellent combination! 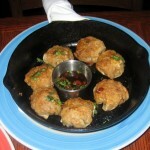 The dumplings are cooked just right…not too soft nor too chewy. And the sauce is good enough to eat alone, but it’s even better when drizzled generously on the wontons. This one is a must! 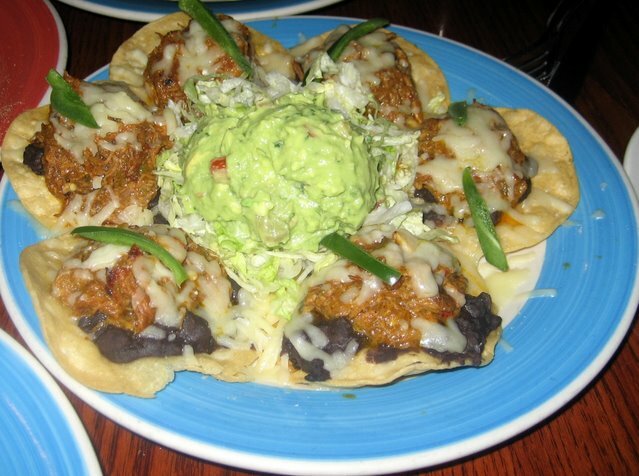 These mouth-watering nachos have tender pork simmered in green chiles and ancho peppers, topped with black beans, melted jack cheese, homemade guacamole and fresh jalapenos. Z’Tejas is liberal with the amount of pork they pile on top of the large nacho chips. 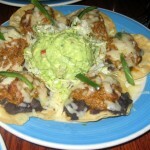 This is a yummy dish, especially if you are in the mood for some good Tex-Mex. It’s not too spicy though…perhaps ask for a few more jalapenos. This dip has artichokes, hearts of palm, spinach, Romano and parmesan cheeses, all baked in a cast-iron skillet and served with a basket of warm tortilla chips. 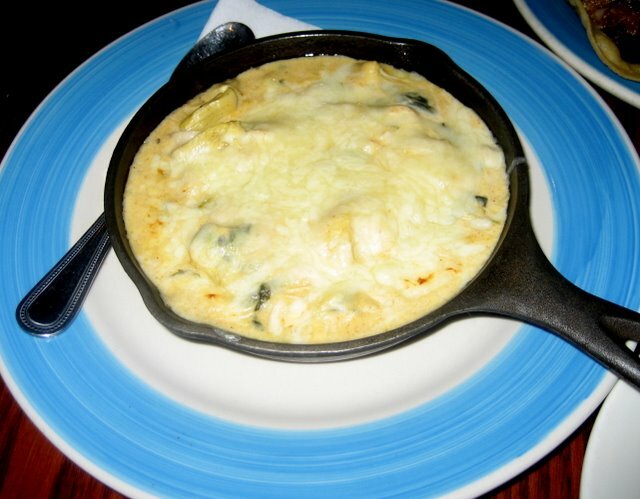 The dip is very creamy, rich and cheesy but also bland. Also, the artichoke chunks are too large for the chips and our chips kept breaking into the dip. This pancake is unique and yummy because it tastes like cornbread, yet is light and fluffy. One of these can fill you up. Honestly, it’s easily one of the best pancakes we’ve had in Austin! The service here is top-notch. The hostess was patient when giving us directions to Z’Tejas. She also gave us input on which appetizers to try and we were seated promptly. 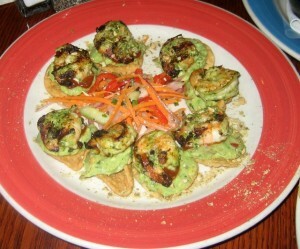 All appetizers are half-price during happy hour – which makes our tummies and wallets very happy! Our waiter was friendly and attentive. He replaced our water glasses before they were empty. When another person in our group arrived later, we requested that some of our food be re-heated. Our waiter reheated the dishes and brought out a fresh warm basket of chips too! Everything was carried out in a kind and efficient manner. Classy yet comfy, sleek yet cozy – Z’Tejas successfully combines both worlds with Santa-Fe style decor. There is plenty of seating indoors and at the bar, and also a large climate-controlled outdoor patio with a fireplace and veranda that overlooks the beautiful Hill Country. The sun was setting when we dined so it was very picturesque. 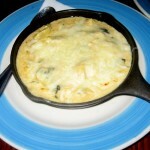 The Southwestern cuisine here is a fusion of Southern, Cajun, and Californian specialties. It definitely seems as if there is something for everyone on the menu at this fabulous restaurant. The brunch at Z Tejas Arboretum is also excellent! I’ve had the breakfast quesadilla and the breakfast migas, both were highly tasty 🙂 I like how you can pick either a muffin (the banana nut ones are delicious) or fruit to come with your meal. I recommend sitting outside on the patio to catch the view of the gorgeous Austin hill country. It’s worth the wait!